This week , a pudding was needed for after dinner with my other mum and dad so I happily sat and browsed through Mary Berry’s Baking Bible and found this easy yet delicious sounding cheesecake. The base of the cheesecake was crushed digestive biscuits with melted butter, pressed into a flan tin and left to set. No problem there. The filling was the grated rind and juice of three lemons, not an issue but you soon know if you have a cut on your finger- or like me, manage to grate your finger with the rind!, to this, Mary asks for some single cream and condensed milk, well as Mary is very fond of the full fat varieties, I substituted the single cream for Elmlea lighter single cream and the condensed milk for the lighter condensed milk, it just cuts down on the amount of calories a little. You put the ingredients in a bowl and whisk together until slightly thickened and then pour it onto the base and allow to set for at least four hours or overnight if possible. I left mine overnight and then looked at what Mary suggests to finish the cheesecake- double cream whipped, and strawberries…….well I made a Kim executive decision and took out the double cream. 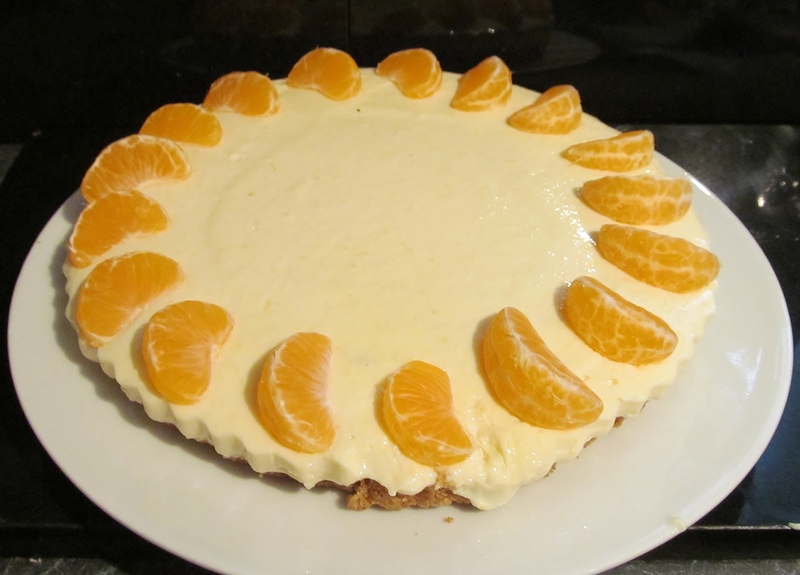 I then decided that strawberries were not the best company for a lemon cheesecake so I simply decorated mine with some clementine segments. We all seemed to enjoy the cheesecake after dinner, and as usual, dad had a second helping. 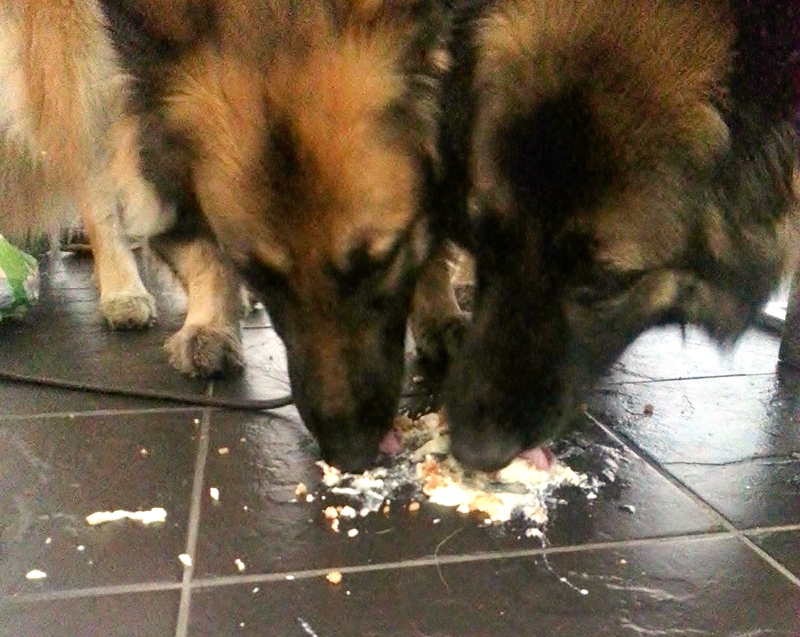 There was about a third of the cheesecake left and we divided that in half so that each household had a little more for supper….or so we thought….our half slipped off the plate…and as you can see, the dogs had a cheesecake feast! 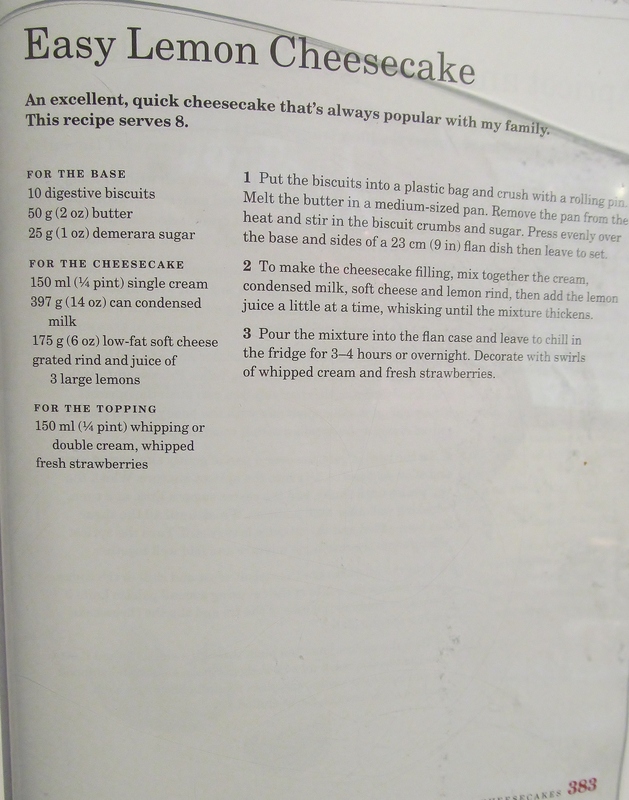 This entry was posted in Kim's cake challenge and tagged Baking Bible, Cheesecake, condensed milk, Cream, Digestive biscuit, Kim, kims cake challenge, lemon, Mary, Mary Berry, Mary Berry's Easy Lemon Cheesecake by kimsideas. Bookmark the permalink.